Hello Dosto Aaj Ke Es Article Me Hum Jange Ki Lollipop Screen Recorder App Ka Use Kaise Kare. Lollipop App Ko Play Store Par 1 Million Downloads Hai. Or 4.1 Ki Rating Mili Hue Hai Jo Ki Bahut Achi Rating Hoti Hai. Yah App Free Hai . A Screen Recorder For Devices Running Android 5.0+ Not Root Required Bhi Ek Acha Options Hai . Screen Recorder App Ke Bare Me Hum Ne Tin Se Char Article Likhe Hai Vo Padhna Chahte Ho To Aap Pad Sakte Ho Du Screen Recorder Ke Bare Me. Aaj Ke Is Article Me Lollipop Screen Recorder Ke Bare Me Janege. 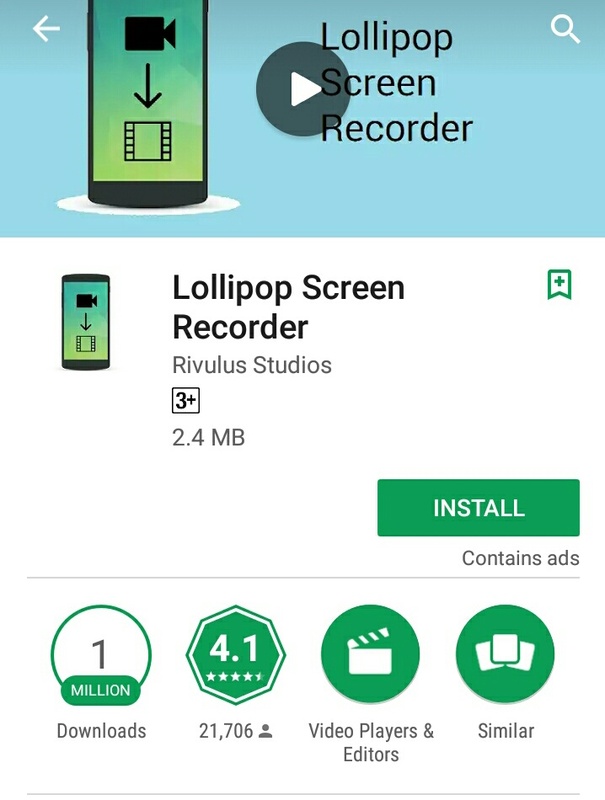 Lollipop Screen Recorder App Bhi Bahut Hi Easy To Use Hai. Jab Aap Apne Phone Me Ise Install Karege To Aapke Samne Tin Option Aa Jayge. Pahle Option Me Aap Recording Ka Pixel Set Kar Sakte Hai Dusre Option Me Aap Recording Horizontal Or Vertical Kisi Isthathi Me Rakhni Hai Use Set Kar Sakte Hai.Or Tisra Option Me Aap Recording Me Sound Ko Enable Rakhna Hai Ya Nhi USe Set Kar Sakte Hai. Is App Ki Achi Bat Yah Hai Ki Use Karne Ke Doran Tach Ko Bhi Recorde Kiya Ja Skta Hai. Iske Sath-Sath Recording Ko Aap Apne Phone Ya SD Card Me Save Kar Sakte Hai. Aap cameras Ka Bhi Use Kar Sakte Ho. Recordings Ko SD card Me Store Kar Sakte Ho. Full Screen Resolution Bhi Kar Sakte Ho Record Me. Resolution Ko Set Kar Sakte Ho. Jab Recording Ko Stop Karoge To Screen Off Ho Jaygi. Recording Ke Satha Audio Bhi Record Kar Sakte Hai.